The 2/13th Battalion was raised in April 1940 from volunteers drawn primarily from New South Wales, initially as part of the 20th Brigade of the 7th Division. 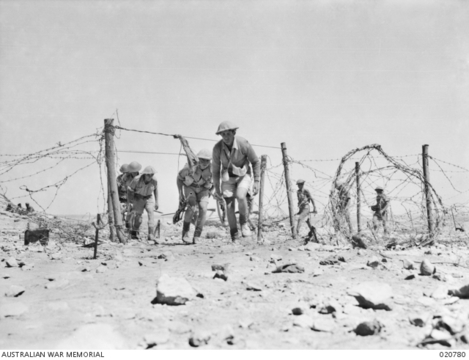 The Battalion served in North Africa in 1941–42, after being reassigned to the 9th Division along with the rest of the 20th Brigade. While most of the 9th Division was withdrawn from Tobruk, during October 1942, the battalion remained and fought alongside the new garrison built around the British 70th Division. Following the lifting of the siege, the battalion returned to Australia during 1943. This service was reflected in a changed colour patch; the original taking on the form of its antecedent unit the 13th Battalion of the 1st AIF surrounded by the grey denoting the 2nd AIF. After Tobruk, however the unit adopted a new colour patch in the shape of a 'T' as did the other Battalions that served there during the siege. After its return to Australia it was based on the Atherton Tableland in Far North Queensland and then deployed to New Guinea where it took part in campaigns against the Japanese in northern New Guinea around the Huon Peninsula in 1943–44. It returned to the Atherton Tableland (a massive training area for the 2nd AIF) ahead of the invasion of Borneo in 1945 in the last actions of the war. It was disbanded in 1946.